At one time, the post-workout meal was considered the most important meal of the day. Termed by some as the ‘anabolic window’, this post-workout time frame was considered the best time to replenish lost nutrients from a hard workout, including muscle glycogen and amino acids. Restoring these nutrients helped spark protein synthesis and glycogen replenishment. However, most research on post-workout nutrition was performed in a fasted state, meaning that the muscles were depleted and ready to soak up any and all nutrients you feed them. The reality is, post-workout nutrition is more likely dependent on the intensity of your workout, how well you metabolize the food you eat and whether or not you ate prior to your workout. So where does that leave post-workout nutrition? If you gave it your all during your workouts, depletion of nutrients has occurred, as has muscle tearing and inflammation. Accelerating the post-workout recovery process is still important to ensure you get back in the gym sooner. 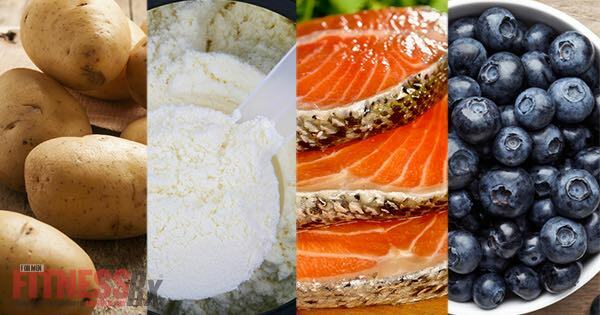 Here are 4 types of foods to eat to post-workout to speed your recovery. If your activity level was high during your workout, then you no doubt burned through plenty of your muscle glycogen. Providing your body with high glycemic carbs, also known as simple carbs, is the best way to replenish lost muscle glycogen. Carbs that are high in sugar, raise blood sugar causing the release of insulin. Insulin is an anabolic shuttling hormone that’s one job is to move sugar, and other nutrients including aminos to the muscle cells where they can be stored or utilized. Insulin’s anabolic response also shuts down catabolic hormones that can reduce the recovery process. Foods like high glycemic fruits and starchy vegetables are a great option for restoring lost energy, not only do they provide plenty of carbs, but they are also nutrient rich, providing vitamins, minerals, nitrates and antioxidants that can help assist in recovery. Reach for a potato; one medium potato delivers 37 g of carbs, 5 g of fiber, along with 70% of your daily value of the antioxidant vitamin C.
After a workout it’s best to avoid proteins that are harder to digest, or take longer to absorb. Skip over steak, and heavier dairy proteins like cottage cheese. Instead, reach for a protein that is fast digesting and provides a high amount of BCAA. Whey protein isolate or hydrolysate are both super fast digesting and contain a full complement of the amino acids needed to activate protein synthesis. Not a fan of protein powders? Reach for eggs, or even a glass of low fat milk. Both of these proteins are considered highly bioavailable, meaning that they deliver all the essential aminos your muscles need, and that they are fully absorbed and utilized by the body unlike other proteins. Antioxidant rich foods such as dark berries can help reduce exercise induced muscle damage brought on by oxidative stress and inflammation. In one study, where participants were given a blueberry smoothie prior to and after exercise, accelerated recovery of muscle strength. A faster rate of decrease in oxidative stress was seen in the group who were given the blueberry smoothie. At 36-hours post exercise the results were significant, showing increased antioxidant capacity. Blueberry’s active compounds include anthocyanin and polyphenolic compounds that are common in many berry fruits. These compounds are thought to reduce oxidative stress and inflammation. Not a fan of blueberries? Reach for raspberries, or blackberries that also boast these beneficial compounds. Add them to a post-workout shake, toss in your oatmeal or even a salad. Aragon A, Schoenfeld BJ. Nutrient timing revisted: is there a post-exercise anabolic window. JISSN. 2013. 10: 5. James MJ, Gibson RA, Cleland LG. Dietary polyunsaturated fatty acids and inflammatory mediator production. Am J Clin Nutr. 2000 Jan;71(1 Suppl):343S-8S. McLeay Y, et al. Effect of New Zealand blueberry consumption on recovery from eccentric exercise-induced muscle damage. JISSN. 2012. 9: 19. Serhan CN, Chiang N, Van Dyke TE. Resolving inflammation: dual anti-inflammatory and pro-resolution lipid mediators. Nat Rev Immunol. 2008 May;8(5):349-61.